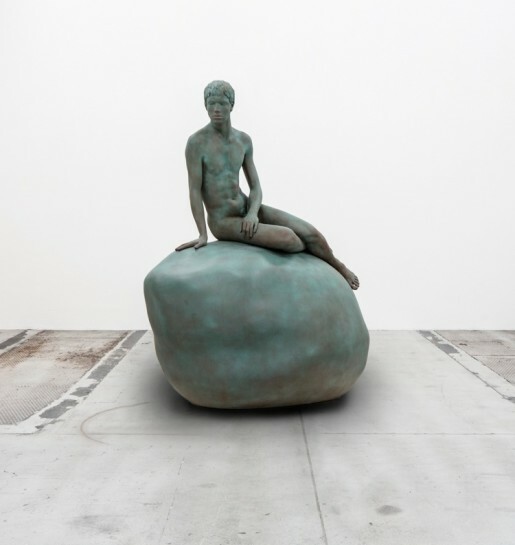 The motif of the siren activates queer themes as well, for instance in Wolfgang Tillmans famous photograph “Lutz, Alex, Suzanne & Christoph on the Beach” or the sculpture “Him” (by Elmgreen & Dragset), which depicts the Copenhagen Little Mermaid as a man. Selected works reflect on the economic crisis, as well as Anthropocene – a new epoch in Earth’s history, shaped by man (Liz Craft and her “Spinster” or Jerzy Szumczyk’s outdoor installation). Anne Uddenberg installations present the motif of the siren in a different, modern light of perfecting the human condition and nature through technology (transhumanism). Aleksandra Waliszewska’s drawings, on the other hand, provide a glimpse into dark phantasies dwelling under the skin of a city by the river. Although this artist draws inspiration from historic works of art, she explores very modern fears of the unknown and of the city: a system complex enough to birth its own mythologies. This many of Waliszewska’s drawings of sirens were never on display before. The accompanying program will also feature Agnieszka Smoczyńska’s film “The Lure” – an 80s-stylized tale of two Vistula-dwelling sirens, awarded at Sundance festival 2016.